Social Security provides financial benefits, tools, and information to help support you throughout life’s journey. We’re excited to announce the launch of geospatial mapping at Social Security! Our new initiative, GeoMaps, complements our Open Government and Open Data Initiatives. For several years, we have published a significant amount of data on Data.gov, but we know people learn and receive information in different ways. Our geospatial maps will provide the public and other interested parties with a deeper understanding of our programs through geographic representations, increasing the transparency of our agency data. At our map gallery, users can view geospatial maps on the Old Age, Survivors, and Disability Insurance benefits by State, and the Help America Vote Verification Transaction by State map. These maps let you view large amounts of our data in a quick, geographic visualization. You can also download the data, and mesh it with your own data to create other maps. 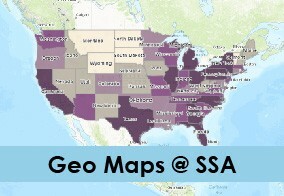 These are our first maps on Geoplatform, a federal platform where we can collaborate and share our geospatial datasets. Social Security is now one of many organizations (e.g. federal, state, local, universities) participating in GeoPlatform, a site managed by the Federal Geographic Data Community and chaired by the Department of the Interior. We encourage you to explore Social Security’s new mapping features by visiting our Open Government Map Gallery, and on GeoPlatform.gov. If there are other types of maps you would like published, you can submit your idea to us. As more geospatial maps become available, we’ll add them to the Open Government Map Gallery! This entry was posted in Open Government and tagged Department of the Interior, Disability, Federal Geographic Data Community, geomaps, GeoPlatform, geospatial mapping, maps, Old Age, open data, Open Government, open government map gallery, Survivors by Alan Lane, Executive Director, Open Government. Bookmark the permalink. Why is this more important than correcting the way as calculates yearly benefit increases for it’s senior citizens? Cost of living keeps going up an up, yet we have years when we don’t receive COL increases, even though it is our money that we put into SS in the first place . . .yes “our” money . . . not the governments money! It’s important to the government that we have geospatial maps. What is important to us is a different or indifferent matter. I will tell you how to live off of $720. a month! First of all you have to downsize. Then get rid of all expensive cars, jewelry and other Stuff!Take a ride share service for shopping. Cut up all of your credit cards, get a gym membership.sell everything of value that would disallow you from Energy, food,shelter assistance. Find a YIMBY to rent.Get a bicycle! I managed to make it because I didn’t put all of my eggs in one basket! Buy cheap land to live off of, YouTube has a tutorial on how to do a homestead! This is the only reasonable way to approach it! PS, You might have to sell your house if you have high taxes. Apply for hardship on taxes. I think you are assuming that the poster has all the luxuries that you mentioned. I am a retired military person who receives social security. Fortunately, my wife and I are both retired government employees. This person may not be so lucky. Judge not. Good point, my mother gets almost nothing and if was not for me she could not have made it with almost nomoney. If you don’t own a home, and you have medical conditions where the medication share is $1000 every other month, and the average rent in an area close to stores is over $1500 for a one bedroom, then I would have to say that $750 just won’t cut it. Not all of us can live off the grid. You no I did do all that you mention, all I have is my rent, electric, gas, water, phone, tv bill, I have nothing, left I did down sized. So now that I did all this now tell me how I can make it. I sympathize. Yes, you have to down-size to be able to subsist. I also got rid of my cable/TV service by buying digital antenna for $12.50 and now have free TV. Got rid of regular phone and got digital(internet) phone for $4 a month and moved to cheaper rental close to bus stop. Check with local utility company for possible discounts for seniors. AND What do the colored states mean, there is no legend key…and what do we do move to a better state for more benefits and leave all we know to go where we know nothing?? We need to wage a mass emailing and fill up there email boxes and do it soon…? We don’t need to know where to congregate to on Social Security. We need a COLA raise so we can stay put where we are. The Democrats claim that they created millions of jobs, incomes of Americans have increase, and the economy is recovering. Yet during the Obama administration we have be denied 3 COLA raises. The Democrats used all the money to fund the Affordable Care Act and the people on Social Security got nothing. The ACA subsidized $2000 in medical expense for a person making $20,000/year. That is a Cost Of Living Adjustment of 10%. People on Social Security got no COLA. We didn’t get a COLA raise and they increased the cost of Medicare Part B. The Social Security Trust Fund is completely invested in US Treasury Security. The other government programs are funded with our money and we get an IOU. The US government has to pay back the Social Security Trust Fund, but they have to borrow over a trillion dollars in debt each year to pay us back. When they can no long borrow money, then they won’t be able to pay us back with interest. All we got is a bunch of worthless IOUs at that point in time. With the interest Social Security claims we are making on our Trust Fund, they should give us a COLA raise. We made all this supposedly interest on the Social Security Trust Fund, but we don’t get a COLA raise. Instead, they reinvest all of our money again back into these other US government programs. They can’t pay us back and we become broke. Trillions of the Social Security Trust Fund money went to the military. NATO needs to pay us back for defending their countries with our military. Military support is not free. The Democrats want to give everything away for free like they do with welfare. China’s retirement system is just as bad as ours. They expect the US government to pay back their money with interest too. Imagine one billion Chinese knocking on your door asking to be paid their money back with interest. There is no trust fund. The small amount of money it contains is used to cover deficits. If you do some research you will find in congressional minutes that even they refer to it as the “so-called trust fund”. Right on Mrs. Smith. The formula for COLAs reflects things seniors aren’t concerned with. It is our money. It is high time for the government to stop talking about SS as an entitlement. There would be no problem if Congress had not ” borrowed” our SS money for their own pet projects. Art. I Sec. 2 must be proud that SSA under age 18 statistics of greater than 77 million children exceeds 74.9 million Baby Boomers, like we had all come to believe, a statistic the non-decennial US Census with 74.1 million children 2016, estimated at 24% of total population in 2010 and 22.9% of total population in 2015, and Annual Children Brief by child stats. gov 73.7 million have come to dispute. I HAVE TRIED TO GET DISABLE BUT THEY SAID NO I WAS HURT IN 84 NO ONE TOLD THAT I COULD DISABLE ??? You have to appeal and obtain all of your medical records and financial records. On average it takes 4years before you will get your first check. The Department of Social and Health Services, (DSHS) will have you reeling on 260 for food and only $200. Cash to survive on. Then if you make it through then they make you GAU, General Assistance Unemployable. Unless you get a job that pays enough that you don’t need them.Going to College with a FAFSA helps. Be strong and smart. Stay out of the bars! Go to church, food and clothing banks will help bolster your spirits. You were hurt 32 years ago, so have you been working since then? Why didn’t you hired a lawyer back then? No matter where you live in the USA your Social Security and Medicare amounts taken from your income and matched by your employer are the same. Regardless of the area we live in, COLA should be adjusted to increase our income. In our area the government employees receive an adjusted pay raise each and every year based on COLA, yet the government denies the individuals on Social Security their right to receive the same amount based on the same COLA!! Remember that the individuals and their employers put the money into the PLAN and the government takes it out for their use and gives the PLAN an IOU. If employers fail to put the employees contributions along with their own into the PLAN off to jail they go. What about that government? It will be better & more productive instead to employ all these huge amount of dollars spend in this mickey mouse operation in getting ALL the ILLEGAL immigrants out of our country before the country collapses due to the stupidity of this liberal = socialist nonsense gov. has created & the rest of us will never have a retirement at all. Albert Einstein was right, people’s stupidity is endless. They keep committing the same mistake over & over but they wonder why there isn’t different outcome. Keep voting liberals up, you’ll have no much to eat sooner than later. I agree with the person that sent this e:mail. Social Security is not a benefit it was and still is earn by people that work and have work all their lives, have put into Social Security for a retirement . If the LIBERAL AND CONSERVATIVE GOVERNMENT STOP TAKING THE MONEY OUT OF SOCIAL SECURITY THERE WOULD BE ENOUGH MONEY IN IT.. I don’t mind helping people that are disable and have work before they got disable, but the once that have not work set up a Program for them to help them instead of Congress, Senate and the President taking any money for their SPECIAL INTEREST PROJECT…SOCIAL SECURITY BELONGS TO THE WORKING PEOPLE THAT RETIRED AND PUT MONEY INTO IT…DO YOU HEAR US BIG GOVERNMENT. Illegals immigrants don’t and can’t collect social security but a lot of them pay into it. Be happy and grateful that you have Social Security benefits as well as Medicare. Yes I agree that this mapping has little value to anyone except bureaucrats. Better they put that money towards annual benefit increase. Whoever developed this program would be fired in the private sector. How many millions of $ were taken out of social security to pay for it? If your answer is that the money came from some other source, that amount should have gone directly into social security. This is what happens when government is too big and departments come up with ways to spend our money in order to justify their jobs. It is a Ponzi scheme, which is illegal in the private sector. Perpetrators of Ponzi schemes end up in jail. SSA should STOP abuse of benefits. Many foreign seniors are migrating from foreign countries under provision of family reunion or stay with their children. They have expensive houses and are receiving good pension amount in their own country. They come (to USA) to live with their sons or daughters. After arriving here they find out ways to draw SSI and SS benefits. They do anything to receive benefits. They haven’t worked here but they receive good amount of US Dollars from our SSA system and that’s why they come here. On other hand their children in this country are in very good financial positions, earn fat income and live in very expensive houses. It is their responsibility to support their old age parents. Its a big burden on our SS system and our society. Another example of the stupidity of our government. You are all barking up the wrong tree. Social Security does not set the amount of money anyone receives, that is done by Congress. The only way to change it is to change the government. Until we have a political party not at the service of the wealthy and corporations nothing will change. We need to have a government that is based on full employment at a livable wage, provides universal healthcare, makes everyone pay their fair tax burden, and provides everyone with reasonable retirement. That will not happen as long as we keep electing Republicans and Democrats. Look to Denmark, Sweden, Norway and Finland for good examples. Welfare should only be for those who cannot work. Everyone else should be expected to work, if they can’t find a job then the government should find one for them or put them to work rebuilding our inner cities, helping in hospitals, nursing homes, schools and other work needed by the local, state and the national government. In addition, no American should earn more than ten times that of the lowest paid American, then watch wages rise. Perhaps we should all start voting for the Green Party as a first move until something better can be built. My wife has progressive multiple sclerosis for 2 years the we are aware of. The Drs. are saying she probably has had it for 5 years, but it went undetected even though she was working at the same job as an oral surgeon office manager at the same office for 17 years. She is 38 years old, receiving SSD every month and basically worked till she couldn’t move, and was in constant pain to the point she was unable to get out of bed and go to work anymore. I am 38 years old and a type 1 insulin. Dependent Juvenile Diabetic for 31 years, that takes between 5-10 injections a day just so I can survive and live. The last 10 years I have been slowly developing diabetic complications. like extreme diabetic neuropathy which I can’t feel my limbs, diabetic retinapathy, Basically I am going down hill fast. I have been working since I have been 16 years old and I had no choice but to file for SSD and I got approved my first time applying.We have 2 kids and after receiving my SSD for approximately 12 months and my attorney getting his cut of my SSD back pay money, I get a letter stating that the SSA made a mistake and over paid me and I should be getting SSI instead of SSD because in 2011, I was a half a work credit shy and they needed to get paid back the money they overpaid me. I asked them why don’t they get the money back from my lawyer? They answered me ‘that the SSA doesn’t deal with getting repayed back the money from the attorneys” and it’s my responsibility. I appealed the desicion and asked for a waiver. My question is if I correct the work credit problem and I go from being on SSI to SSD, IS THERE A MAX FAMILY LIMIT ON HOW MUCH MONEY WE CAN COLLECT EVERY MONTH BETWEEN MY WIFE’S SSD OF $1,181.00 AND MY SSD of $1,701.00 AS A COMBINED INCOME EQUALLING $2882.00 for a family of 4? It’s so confusing!! My wife needs to live in all year round warm weather, and we were thinking of moving to a state like Florida or the USVI or Puerto Rico. Is moving to these US commonwealth states a good idea? Please help with any advice, answers, loopholes etc. Thank you very much! Who should we vote for President that is pro Social Security and wants to help poor and middle class people? Sir, I’m sorry to heard of your problem. Look, P. Rico its a independent state of the US, you better check up their laws BEFORE you would move there, I’m sure you’re cover by SSA laws & so on, but its better to make sure you be alright there besides that the crime rate is terrible there, unemployment is way high & so on & on. In the other hand in Fl. you would be in home, Fl is expensive to live on, all the east cost of the States is. All depending of what part of Fl. you’ll move + the weather, you could be in hurricane areas, you must be careful for it. Trailer parks sometimes offering cheap properties, but the land rent can be very costly, besides that Fl. has a very high crime rate these days. Please look for another venues to move on to, they’re, you just have to look for them, invest sometime investigating BEFORE you move. Some of the southern states (in their northern parts) are warm enough & cheaper to live than in the more populated states (or big cities), but you have to watch for high crime areas, remember persons like you & me, we could be a prey for criminals due to our age, don’t be afraid, just be careful. I live for sometime in Panama, Central America, I have to pay my own meds, drs & so on from my own packed here, but its ok for me. The part I’m living is cheap, so I live under my means & weather is not that bad. Hi Theo. Unfortunately, but for your security, we do not have access to personal information in this blog. In your situation, it is best to contact your local office or to call our toll free telephone number at 1-800-772-1213, Monday through Friday between 7 a.m. and 7 p.m. and ask a representative to assist you. Just another waste of resources. If you wanted to post something valuable how about a By Name Directory, with phone numbers and e-mail addresses for employees at the local district offices. My closest office still refuses to identify the Manager by name (employees are terrified). No e-mail except to the Manager who may or may not allow someone else to respond, no phone numbers to employees. Please see our “Comment Policy” Bob. We reserve the right to determine which comments are acceptable. Remarks containing personal identifiable information such as Social Security numbers, postal and email addresses, phone numbers, etc., will be removed. In addition, in order to protect and respect their privacy, we abstain from posting our employees’ names. Thank you for your understanding. Enough of all the COLA complaints! The president has NOTHING to do with COLA decisions. This is based on the consumer price index. It is based on inflation. If inflation rises then there is a COLA if there is no inflation, there is no COLA! Duh! You can’t have it both ways! Want a COLA then contact your senators and representatives. Also, it is unrelated to the Affordable Care Act. Also, congress does not determine the amount of SS benefits anyone receives. This is all based on the Social Security Act and your work and earnings over 35 years of work history. Good explanation! Go check facts with Dept. of Labor about the CPI. And keep in mind that if there’s a COLA it will be gobbled up by the Medicare Part B monthly premium. A lot of people have been paying $104.90 since 2013 because of the hold harmless provision. But in reality in 2016 it is $121.80 and expected to go up again in 2017. You can make out better using coupons than having a tiny COLA. COLA is based on the CPI of the third quarter of the previous year. It doesn’t matter what happened more than 2 years ago. Let’s say the recession drop the CPI down 30%. We don’t get a COLA raise the next year based on the CPI. We don’t lose 30% either. If the economy recovers from the recession by 30%, then we get a 30% increase. After the recession the stock market recovered at a all time high. The real estate housing went up. Everything in the economy went up high, but we got some measly little COLA and denied a COLA raise last year. The President is in charge the Department of Labor. Blame the person at the top. Obama issued an executive order to the Social Security administration about the security features of the My Social Security account. The SSA had to change it. He’s other executive order was to take guns away from the mentally ill on Social Security and the SSA complied with the executive order. The President could get the Department of Labor to change it’s policy, but he has done nothing. Since they came up with COLA, every President has found a way to give us a COLA raise since 1975. The Obama administration squandered our money into the other government programs that they can’t give us a raise. I don’t know what formula the local government use, but they get a COLA raise every year. Even the federal government employees get a raise every year with the interest on our Social Security Trust Fund money that we have to reinvest into the US government. We get screwed by the system. The Social Security Trust Fund is the biggest ponzi scheme ever. More money has to keep coming in and nothing can be taken out because the other government programs are robbing the funds and say we are making interest on it, but we are never able to cash out. You got to keep reinvesting all the money including the interest back into the government programs and they can’t pay the people on Social Security a COLA raise. Automatic benefit increases, also known as cost-of-living adjustments or COLAs, have been in effect since 1975, and it is based on the annual increase in consumer prices. By law, the Social Security Administration uses the Consumer Price Index for Urban Wage Earners and Clerical Workers (CPI-W) determined by the Bureau of Labor Statistics (BLS) in the Department of Labor to calculate Cost-of-living adjustments (COLAs). To learn more, visit the “History of Automatic Cost-Of-Living Adjustments” web page. Thanks! Thank you L. Rod for your comment. Hopefully everyone with a vested interest in how the SS Act works will get some knowledge to support their comments. The boomer generation was/is a hard working generation. I am confused as to how boomers (my generation) think that they were not supposed to save for retirement to supplement the SSI. It was always designed to supplement, not be the main source of income. AND yes you are right, $720 is not enough to live on. That tells me a couple of things, you didn’t work much through the years to earn the necessary credits to get the maximum SSI or that you were self employed and didn’t pay in self employment taxes properly through the years. Does anybody listen to these very valid concerns or do they just disappear in thin air. WHAT EVER HAPPENED TO THE LOCKBOX? The Democrats want to expand the government programs. They want to bankrupt the US Government and our Social Security Trust Fund since the US Government has to pay us back. How can the US government pay us back when they got no money. Every couple of months the US government is on the brink of shutting down, unless they can come up with more money. What is happening with our Social Security Trust Fund money that the US Government borrowed? Our money is gone and we are left with a bunch of IOUs. Obama is going to strip the people with mental illness on Social Security their second amendment right to bear arms. They are going to take away our Second amendment rights, but we still have the rights to vote. Lets vote these Democrats out of office of the Presidental office and Congress. If we still have our rights to vote, then we shouldn’t be treated as criminals out to shoot people. Felons cannot vote or own a gun. People with mental illness are not felons. Democrats treats us like criminal felons. Democrats discriminate against people with mental illness. Over 500 people were shot in Chicago this year and how many of the shooters had a mental illness. Most of the shooters are probably teenagers. How about all those kids being shot in Miami by teenagers? Gangs, minors, and the police are shooting people up and Social Security and the Democrats are worried about the mentally ill. The mentally is blamed for everything. We are being discriminated by the Democrats and they want to take away our Second Amendment rights. The Democrats labeled mentally ill people as violent criminal. We are shot and killed by the police. It is shot first and ask questions later. You are holding a broom, you will be shot dead. You are holding a toy truck, you will be shot dead. What ever you are holding, you will be shot dead. The thing people have to watch out for in the near feature is their 401K. Democrats are manipulating the stock market. The Feds have not raised interest rates and when they do shortly, you will lose most of your 401K if you have it invested in high risk. The Democrats are messing with our 401K. The Democratic politician’s investment portfolio always seem to do well when they are manipulating the system and they know the exact time when to pull out of the stock market. Where did the funding come from for this project? I probably won’t get an answer. VERY INTERESTING ITEMS HERE. I DID NOT SEE ANY BODY ASKING WILL THERE BE A COLA DONE FOR 2017. SOMETHING INTERESTING TO KNOW. IT IS A FACT OF LIFE THAT SENIORS ARE NOT THOUGHT OF UNTIL THEY HAVE TO BE. LETTING IT GET YOU DOWN IS TELLING THE SSA AND THE GOVERNMENT THEY HAVE YOU RIGHT AT THE POINT THEY WANT YOU. THINK ABOUT IT. Socialist security can launch all the GEO maps they wish, it will NEVER fix their broken moral compass! Forcing adult disabled children to only marry another disabled person, at the threat of loosing all benefits, is nothing short of OPEN DISCRIMINATION! An adult disabled child should have the freedom to marry anyone (including able bodied persons) if they want to. Why did’nt SS pass a COL increase in 2016? Part B increased, part D premiums and copays also did. This was an increased COL for me and everyone else. Will there be a COL increase I 2016 or the Same. i think you are assuming that the poster has all the luxuries that you mentioned. I am a retired military person who receives social security. Get free online coupons, discounts, coupon codes, and promo codes from adkey.org. Find great deals and promotional discounts on your online purchases at thousands of hot online stores. A lot of good information….. Trying to find out if I will loose any of my retirement if I move to a different state but can’t find an answer.